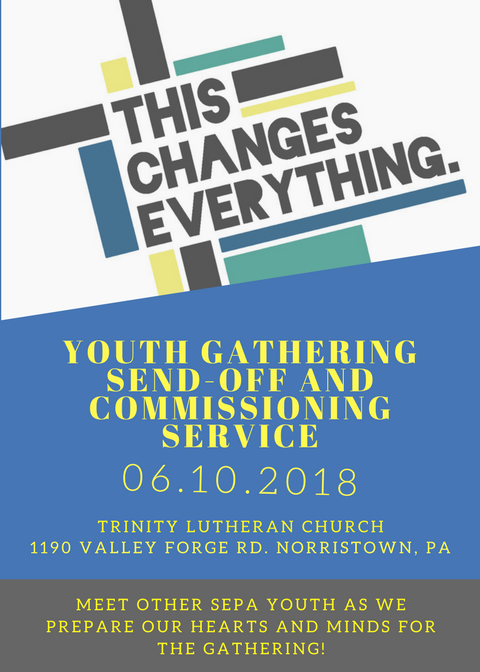 Save the date for our SEPA Synod Send-Off and Commissioning Service for all youth and adult participants in this summer’s ELCA Youth Gathering on June 10th at 2 PM at Trinity Lutheran Church in Fairview Village (1190 Valley Forge Rd, Norristown). This will be a great opportunity to meet other youth going on the trip and prepare your hearts and minds for the gathering! More information will be coming out soon, but mark your calendars now – you won’t want to miss it!